We have been told that there are only 488 of this rare 4 door model that have been restored. Beautiful colors and accessories. The interior of this car is outstanding. All new tan pin striped upholstery in correct fabrics by Hampton Coach. The Dash is Beautiful. Restored gauges, digital clock. The original temp gauge doesn't work and has been replaced with a temp gauge under the dash. All the knobs, handles, radio, etc. are near mint condition. Near showroom quality two-tone, dark silver metalic paint on top and dark blue metalic paint on the bottom. Replated bumpers. Grill wings and Grill guard were added. White wall tires are fairly new. New weatherstrips. Glass is new. Runs very well. Has a new wiring harness, new radiator, new brakes and lines. New carb and alternator. New springs. New gas tank and exhaust. New rebuilt transmission and clutch. Visor, mirrors, 2 retractable front seat belts and turn signals with beepers were also added. The body is straight and the doors and trunk fit beautifully. 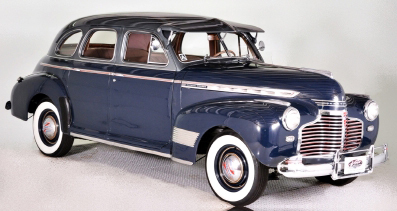 It holds a 6 cylinder, 216 cubic inch engine produced in 1949. Approximately 900 miles on this beautiful restoration. Truly a gem! Priced to sell. $24,595 Plus shipping. Contact Webpromos.net for Vintage Auto Restoration.